Rail technology leader Bombardier Transportation has signed a contract with Porterbrook and c2c, to supply 60 new BOMBARDIER AVENTRA vehicles for use on the United Kingdom's c2c rail franchise, together with an eight-year maintenance and support services contract. The overall value of the rolling stock and maintenance contracts are valued at approximately 105 million GBP (120 million euro, $140 million US). The maintenance contract will run from the introduction of the trains until November 2029. Rail Minister Paul Maynard said: "We are making the biggest investment in the railways since Victorian times to meet the growing demand for rail travel and improve both journey times and passenger comfort. These British-built Bombardier trains, which are coming into service earlier than planned, will provide much needed extra capacity for thousands of passengers across London and Essex, and also come with facilities such as Wi-Fi, air-conditioning and plug sockets." Ernesto Sicilia, Managing Director, Trenitalia UK said: "We are delighted to announce this deal, which demonstrates our focus on long-term investments in the UK market and our desire to constantly improve the standing of our trains and to deliver visible and valuable improvements on our services. 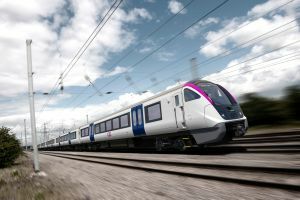 Since our entrance in the UK market the original new trains' investment plan, which included a phased delivery from 2019 to 2024, has been accelerated overall and we are extremely proud that the new fleet will start to be delivered from summer 2021, three years earlier than what was originally planned." Richard Hunter, UK Managing Director, Bombardier Transportation, said, "Our modern AVENTRA trains are proving ever more popular and this order will help transform the travel experience for c2c passengers and deliver almost 20% more capacity to c2c's fleet. This important contract win demonstrates Bombardier is the first choice when it comes to delivering high quality, transportation products and services, and value-adding long-term solutions for our customers. It's yet another endorsement of our workforce and the quality of the products we design, engineer, manufacture and service in the UK." Bombardier will deliver and 60 electric carriages by September 2021, made up of 100mph 10 x 6-car trains. Built at Bombardier's facility in Derby, the AVENTRA product family platform has the flexibility to meet several market segment needs and complements the fleets that have already been ordered for Transport for London's Elizabeth line (Crossrail), London Overground's LOTRAIN, and the South Western, Greater Anglia and West Midlands franchises. The trains will join the existing Bombardier-built and maintained ELECTROSTAR fleet on the c2c network. c2c is the award-winning train operator running services between Fenchurch Street and Shoeburyness, serving 26 stations in East London and South Essex. Owned by Trenitalia, c2c is one of the UK's most punctual and popular train operators and over 46m journeys are made on our services every year. Italian-based Trenitalia is one of Europe's leading rail operators and the passenger rail arm of FS Italiane Group. Trenitalia manages passenger services with long haul connections, both on high speed (Frecciarossa) and conventional lines, and regional and metropolitan services. Overall FS Italiane Group runs 8,000 trains a day, serving 600 million passengers and carrying 50 million tons of freight a year, over a network exceeding 16,700 kilometres. Bombardier, AVENTRA and ELECTROSTAR are trademarks of Bombardier Inc. or its subsidiaries.